Disney’s The Nutcracker and the Four Realms, which is arriving on Blu-ray today following its holiday release back in November, is one of those films that is often beautiful to look at but also feels sort of empty. It’s not a bad film, but it is a somewhat disappointing one, starting off strong before sort of fizzling out by the end. Still, despite its lacklustre showing at the box office, it’s the sort of thing that might find more of an audience on Blu-ray come next Christmas, and it isn’t without some visually pleasing moments. For more on the film itself, my full review can be found right here. The Blu-ray also includes five brief deleted scenes (The Stahlbaums Arrive; Follow Your Ribbon; Clara Asks About Her Mother; Left, Left, Left, Left, Left; and Out With the Old), as well as two featurettes. First up is On Pointe: A Conversation With Misty Copeland, which features the acclaimed American Ballet Theatre dancer talking about what went into shooting the film’s centrepiece ballet sequence, joined by choreographer Liam Scarlett. Next is Unwrapping The Nutcracker and the Four Realms, which offers a broader look at the making of the film. It focuses mostly on the admittedly beautiful art direction and production design, including the impressive sets that were built at Pinewood in London, which utilized classic painted backgrounds to help add depth. The featurette also gives Keira Knightley a chance to explain the acting choices behind her scenery-chewing portrayal of Sugar Plum. To paraphrase, she chose to play her like a drag queen Marilyn Monroe, which I guess kind of puts her relentlessly campy performance into perspective. Finally, the disc also includes music videos for the original song “Fall On Me” performed by Andrew Bocelli and his son Matteo Bocelli, and “The Nutcracker Suite” performed by acclaimed pianist Lang Lang. Overall, this is a slim but acceptable selection of bonus features. 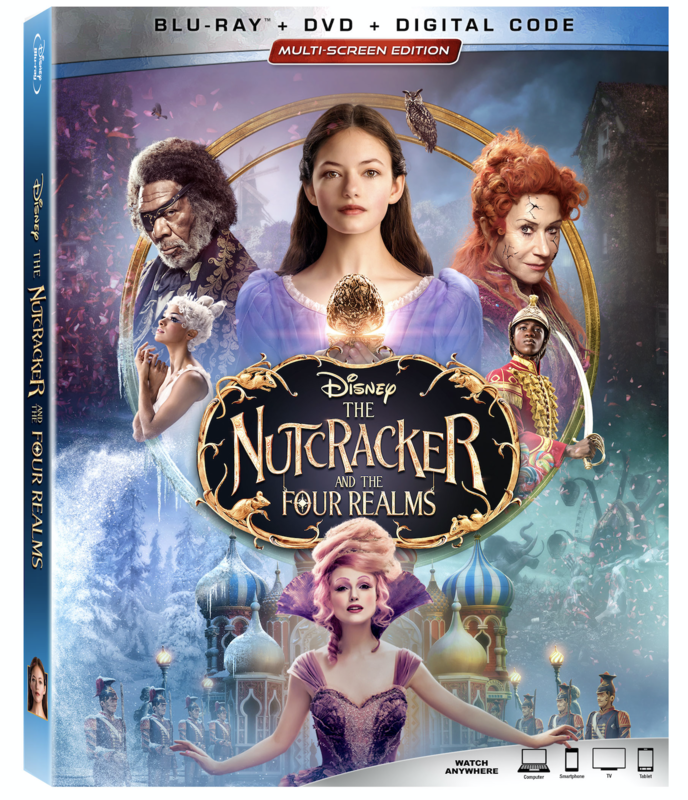 The Nutcracker and the Four Realms is a Walt Disney Studios Home Entertainment release. It’s 99 minutes and rated PG.